Boston, MA and Arlington, VA, January 8, 2015 – Ever wonder what secrets and stories your family history holds? This is the question posed to everyone’s favorite aardvark and his friends in “Fountain Abbey,” an all-new, Downton Abbey-inspired episode of ARTHUR, premiering January 26 on PBS KIDS (check local listings). “Fountain Abbey” will also be available on DVD January 27 through PBS Distribution. In the drama-filled “Fountain Abbey,” Muffy finds herself absolutely devastated when she learns her great-great grandmother, Mary Alice, wasn’t royalty at all. She was a common maid – oh, the indignity! However, through reading Mary Alice's diary, Muffy is transported back in time to the famous English estate where her ancestor worked. There she discovers the surprising story behind her humble roots. "An abbey in jeopardy, a lady's maid causing trouble, and the Dowager Countess unimpressed by all. Sound familiar? We hope ‘Fountain Abbey’ will be a show the whole family can enjoy together!" says Carol Greenwald, senior executive producer of ARTHUR. “PBS is committed to engaging families with content that is educational and entertaining and this new episode of ARTHUR is no exception. 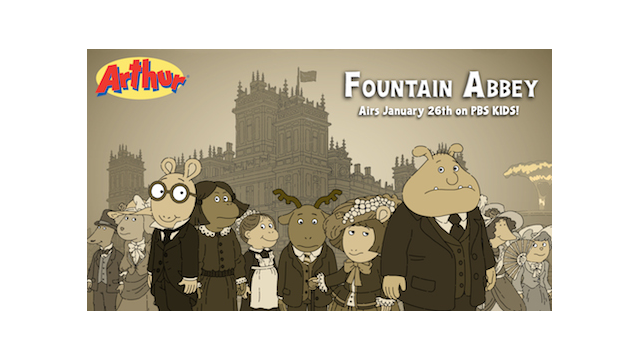 ’Fountain Abbey’ promises to delight not only children, but an entire generation of ARTHUR fans that grew up with the series and can appreciate the humor and fun of the DOWNTON ABBEY-inspired references,” said Lesli Rotenberg, General Manager, Children’s Media, PBS. The “Fountain Abbey” story is paired with “Arthur Calls It,” a story in which Arthur must deal with peer pressure from his classmates, causing him to doubt his decision to call his best buddy Buster “out” during a baseball game. Is that a foul play, or should Arthur stick to what he believes is right? The week of ARTHUR continues with funny storylines about everyday life and tongue-in-cheek homages to The Wizard of Oz and The Tell-Tale Heart. In each episode, the characters learn valuable lessons about honesty, empathy, and determination. Produced by WGBH, the Emmy Award-winning PBS KIDS series ARTHUR explores childhood challenges with heart and humor, while teaching problem-solving and pro-social skills. On the ARTHUR website, kids, parents, caregivers, and teachers can access a variety of fun and educational games, lesson plans, and activities. Families can also keep up with Arthur and his friends on the new ARTHUR Family Health Website — a resource that helps caregivers and children build and maintain healthy living habits. For images, episode descriptions, and more information on ARTHUR, visit PBS PressRoom. “Fountain Abbey” – Muffy’s devastated when she learns her great, great grandmother Mary Alice wasn’t royalty, but a common maid. The indignity! However, Mary Alice’s old diary reveals a more interesting story. “Arthur Calls It” – Pressure from his classmates has Arthur doubting his decision to call Buster out during a baseball game. Will he succumb to peer pressure, or stick with what he believes is right? “Whip. Mix. Blend.” – When Rattles’s mom starts dating Archie Vanderloo, Rattles finds himself spending lots of time with Archie’s kids. The problem is, Rattles doesn’t have anything in common with these twins! Can this blended family learn to get along? “Staycation” – Arthur offers to babysit so that his parents can enjoy some peace and quiet in the backyard. What could go wrong? With D.W. on the loose…just about everything! DVD Special Features: Printable coloring pages and activities. ARTHUR, based on the best-selling books by Marc Brown, is television's longest-running children’s animated series. Over the past 18 seasons, ARTHUR has remained one of the highest-rated weekday children’s series on PBS among children 4-8. ARTHUR has won numerous awards, including the George Foster Peabody Award, a BAFTA, and seven Daytime Emmys®-four for Outstanding Children’s Animated Program. ARTHUR is produced by WGBH Boston and 9 Story Entertainment. Executive producers are Carol Greenwald (WGBH), Vince Commisso (9 Story), and Marc Brown (Marc Brown Studios). Directed by Greg Bailey. Funding for Arthur is provided by public television viewers. Corporate funding is provided by Chuck E. Cheese’s®. For more information, visit pbskids.org/arthur and follow ARTHUR on Facebook and Twitter. PBS Distribution offers a diverse range of programming to our customers, including Ken Burns’ films, documentaries from award-winning series such as NOVA, FRONTLINE, AMERICAN MASTERS, NATURE, and AMERICAN EXPERIENCE, dramas from MASTERPIECE, as well as films from independent producers and popular children’s programming. As a multi-channel distributor, PBS Distribution offers consumers high-quality content in multiple formats including DVD, Blu-ray, digital download, and digital streaming. PBS Distribution is also a leading source for factual content for international broadcast, cable and satellite services.